I love it when I get to enjoy a muffin around mid-morning with my second cup of coffee. It’s the time of day I’m a feeling a little peckish and I need something to carry me through. I don’t always get to indulge in this treat but when I do, it has to be a muffin of good quality. It has to come from a good bakery or it has to be homemade. 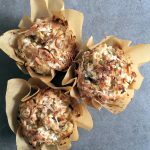 This Toasted Coconut Muffin with Chocolate is my latest favorite. So good!!! Coconut and chocolate is always a winning combination. I bet you can already taste it. I usually lean towards fruit flavored muffins as my go to, but when I came across a toasted coconut muffin in a coffee shop, I had to give it a try. Yes, it was good, really good, but I felt it needed something. 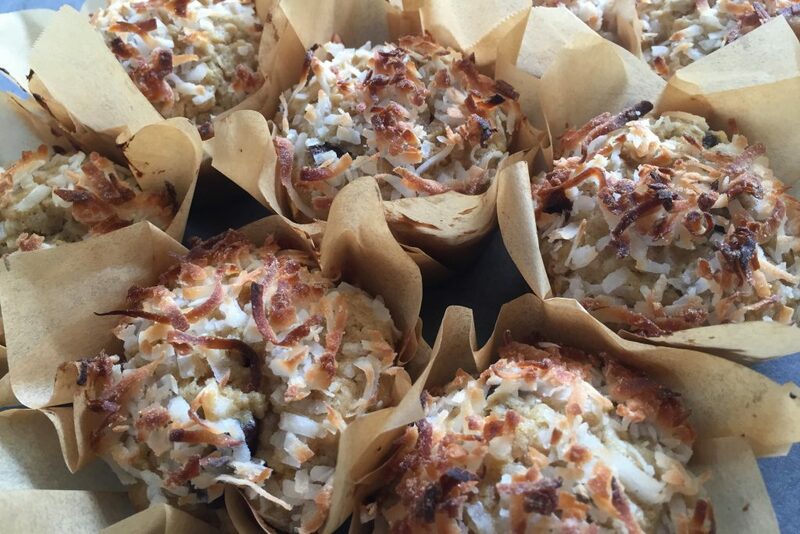 I now had a quest to make a toasted coconut muffin at home that was better than that coffee shop’s. 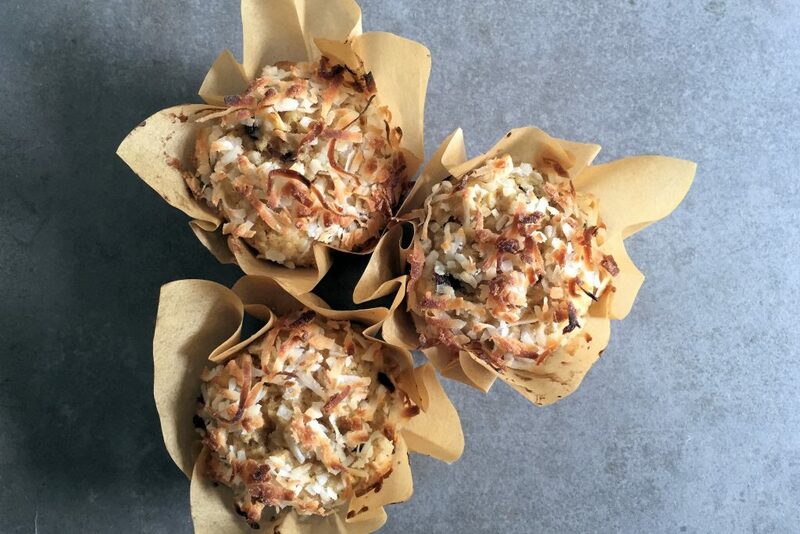 Pouring over my cookbooks of old and new, I was excited to find one of my favorite bakers had a recipe for toasted coconut muffins. Kathleen Tate’s recipe baked up beautifully and you could just leave it be. Rich in flavor with added oats and brown sugar, the texture was moist with a satisfying crumb. But as it is my nature, I tweaked things a bit, adding in a little vanilla, some chocolate chips and sprinked coconut on top for a little crunch. It’s easy to make, so get out your mixing bowls. 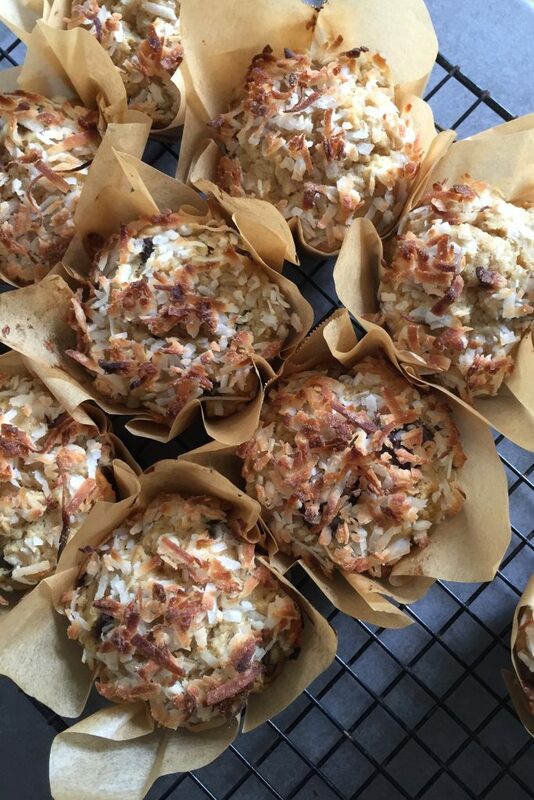 Recipe adapted from Toasted Coconut Muffins found in “Kathleen’s Bake Shop”. Prepare a 12 portion muffin tin with paper cups. In a medium size bowl, mix together the oats and the buttermilk. Let sit for 30 minutes. 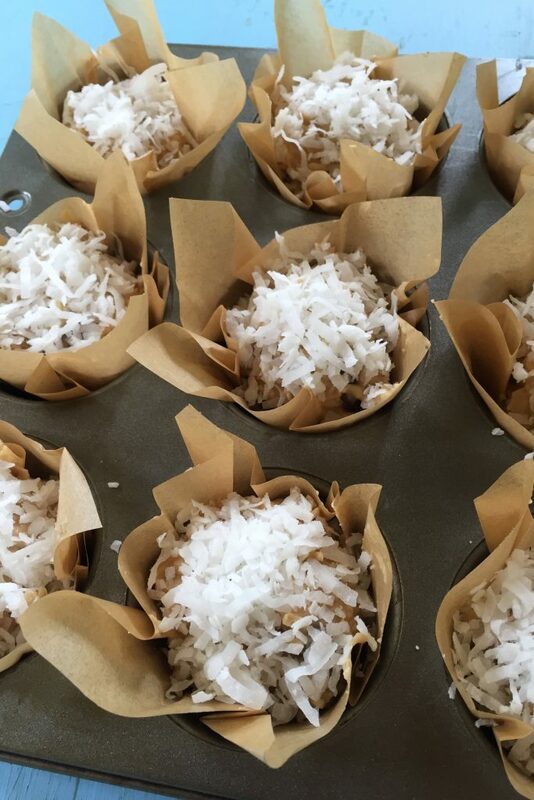 Spread out 1 cup of the sweetened coconut and bake in the oven for about 10 minutes until a light golden brown. Start checking it after 5 minutes and every minute or so thereafter, tossing it around a bit to get even browning. Remove the coconut from oven and let cool. Raise oven temperature to 400° F.
In a medium size bowl, measure out and whisk together the flour, baking soda, baking powder, salt and the toasted coconut. Set aside. In the microwave or in a small sauce pan, heat the butter until just melted. Set aside to cool. In a large bowl, mix together the brown sugar, the oat and buttermilk mixture, vanilla and the egg together. Mix in the melted butter. Gently fold in the flour mixture into the wet sugar mixture just until you no longer see traces of flour. Fold in the chocolate chips. Using an ice cream scoop, portion the batter evenly into 10 or 11 of the cups of the prepared muffin tin. The batter should reach the top. 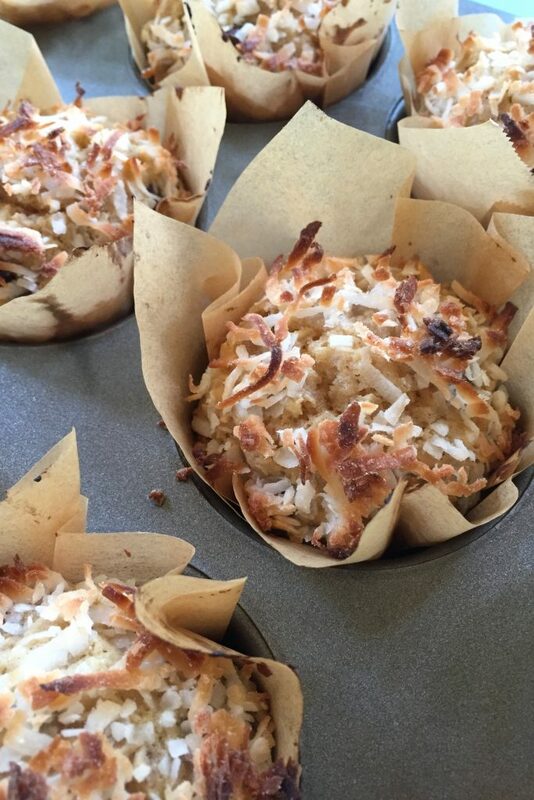 * Using the remaining un-toasted sweetened coconut, sprinkle some on the top of each muffin. About a tablespoons worth. 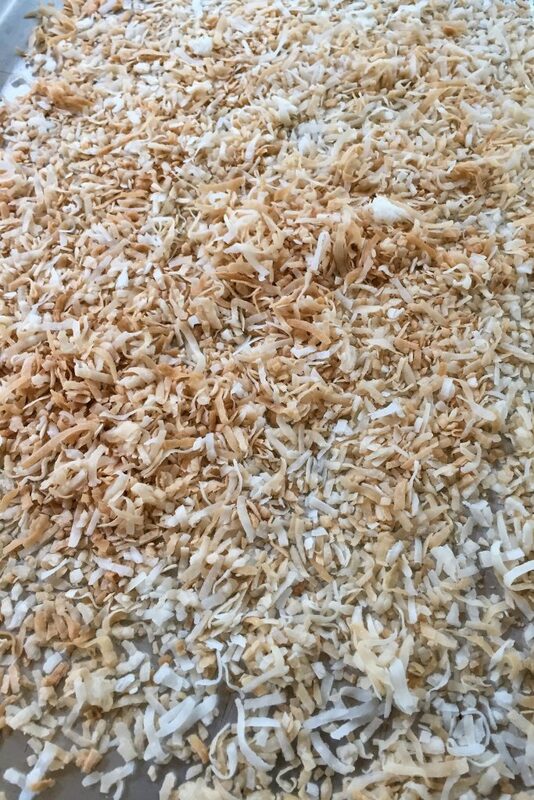 You may not end up using all of the coconut. Bake for 15 to 16 minutes or until a cake tester comes out with just moist crumbs. * Cool for a few minutes and then remove muffins and have them finish cooling on a wire rack. Serve warm or at room temperature. Chocolate chips are optional. You could do other mix-ins such as nuts or dried fruit. I know its weird that the recipe does not make 12 muffins. 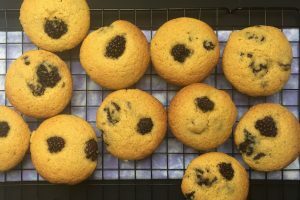 You could stretch the batter to 12 but the muffins will be smaller. Adjust your baking times. 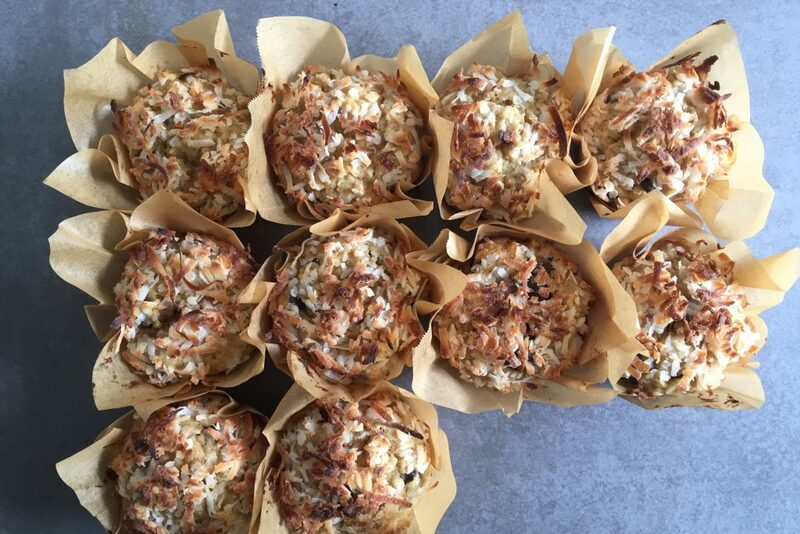 The coconut on top of the muffins get very brown during baking. That is good as it will give you a nice crunchy top. You do not want to actually burn the coconut, so watch your baking during the last few minutes. If it looks like that may happen, place a sheet of foil lightly over the top for the last few minutes. 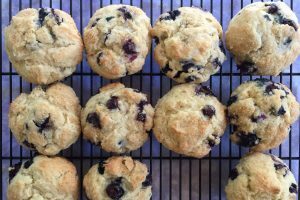 Try these Cakewalk Kitchen muffins recipes.